The process of extraction, transformation and load (ETL) is central to any data warehousing initiative. With advances in cloud data warehouse architectures, customers are also benefiting from the alternative approach of extraction, load, and transformation (ELT), where data processing is pushed to the database. With either approach, the debate continues. Should you take a hand-coded method or leverage any number of the available ETL or ELT data integration tools? While there are advantages to both and some will choose a “one or the other” approach, many organizations select a combination of a data integration tool and hand coding. Code provides developers with the flexibility to build using preferred languages while maintaining a high level of control over integration processes and structures. The challenge has been that hand-coding options are traditionally more complex and costly to maintain. However, with AWS Glue, developers now have an option to easily build and manage their data preparation and loading processes with generated code that is customizable, reusable and portable with no infrastructure to buy, setup or manage. In this blog, we’ll cover how to leverage the power of AWS Glue with Snowflake and how processing is optimized through the use of query pushdown for ELT. 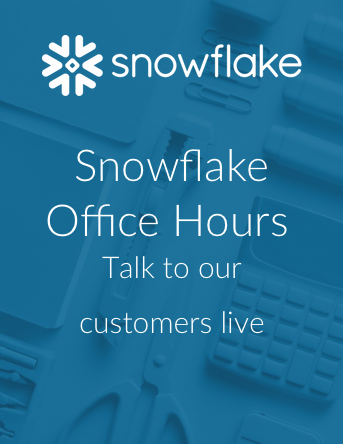 Snowflake customers now have a simple option to manage their programmatic data integration processes without worrying about servers, Spark clusters or the ongoing maintenance traditionally associated with these systems. AWS Glue provides a fully managed environment which integrates easily with Snowflake’s data warehouse-as-a-service. Together, these two solutions enable customers to manage their data ingestion and transformation pipelines with more ease and flexibility than ever before. With AWS Glue and Snowflake, customers get the added benefit of Snowflake’s query pushdown which automatically pushes Spark workloads, translated to SQL, into Snowflake. Customers can focus on writing their code and instrumenting their pipelines without having to worry about optimizing Spark performance (For more on this, read our “Why Spark” and our “Pushing Spark Query Processing to Snowflake” blogs). With AWS Glue and Snowflake, customers can reap the benefits of optimized ELT processing that is low cost and easy to use and maintain. Search for and click on the S3 link. Create an S3 bucket and folder. Add the Spark Connector and JDBC .jar files to the folder. Create another folder in the same bucket to be used as the Glue temporary directory in later steps (see below). Switch to the AWS Glue Service. Click on Jobs on the left panel under ETL. Add a job by clicking Add job, click Next, click Next again, then click Finish. Provide a name for the job. Select an IAM role. Create a new IAM role if one doesn’t already exist and be sure to add all Glue policies to this role. Select the option for A new script to be authored by you. Give the script a name. Set the temporary directory to the one you created in step 2c. Under Dependent jars path, add entries for both .jar files from 2b. 2. Under Job parameters, enter the following information with your Snowflake account information. Make sure to include the two dashes before each key. Click Next, click Next again, then click Finish. You will be prompted with a blank script interface. Use the following sample script to test the integration between AWS Glue and your Snowflake account. This script assumes you have stored your account information and credentials using Job parameters as described in section 5.6.2. To securely store your account information and credentials, see the following article which describes how this is accomplished with EC2: How to Securely Store Credentials with EC2. AWS Glue and Snowflake make it easy to get started and manage your programmatic data integration processes. AWS Glue can be used standalone or in conjunction with a data integration tool without adding significant overhead. With native query pushdown through the Snowflake Spark connector, this approach optimizes both processing and cost for true ELT processing. With AWS Glue and Snowflake, customers get a fully managed, fully optimized platform to support a wide range of custom data integration requirements. Start Your 30-Day Free Trial. Receive $400 of credits to try all Snowflake features.